You would have to be blind not to see at this point that the future of our computing lives will be mobile. Recent statistics gathered by research group Forrester only back that up. According to the report, there will be 1 billion smartphone customers by 2016, with 257 million smartphones and 126 million tablets in the US alone. Of those worldwide billion mobile devices, Apple, Google and Microsoft will control some 90% of the market with their respective platforms. 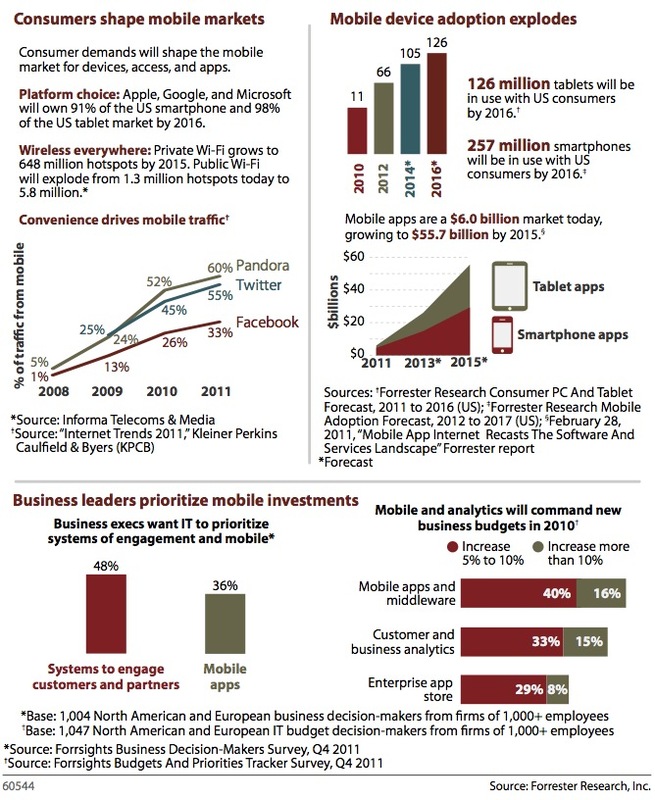 Business users will factor heavily into these numbers, with some 350M employees using smartphones. The majority of these will not be company phones either, as the majority will follow the ‘consumerization of IT’ trend, with some 200M bringing their own smartphones to work. Tablets don’t escape the trend either, with some 70% of these used for work being purchased by the employees themselves. This trend to mobile will result in a mobile spending market of $1.3 trillion and an app market worth $55B, forecasts the group. In order to compile the numbers, 61 different companies large and small, including AT&T, Citrix, Microsoft, RIM, Salesforce, Skype, Sugarsync, Dropbox, Apperian and more were interviewed. The document is largely aimed at the Chief Information Officers of companies, encouraging them to establish positions explicitly for mobile, which will blossom so much over the next few years that it may even eclipse traditional IT and requires its own set of rules enterprise systems. Mobile can’t be treated the same way as a stationary terminal or even laptop computer can and companies have to be ready for the influx. There is also the matter of a company being prepared for an explosion of interactions and transactions that comes from lowering the barrier that customers have to interact with their products. Simply put, if you have constant access to a product, you will use it more. And people are never without their smartphones. 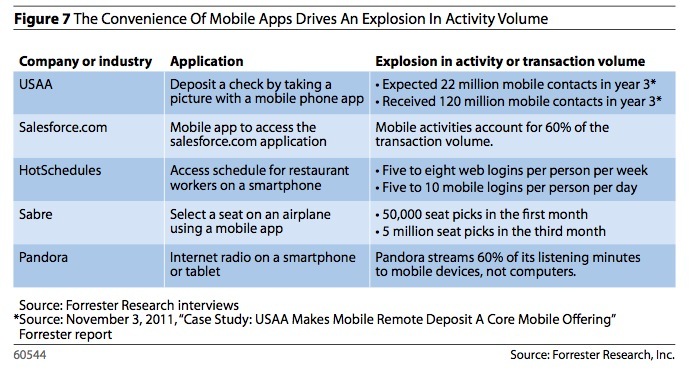 Examples of several companies, including Pandora, USAA and Salesforce show that mobile engagement is through the roof over traditional channels. Pandora alone gets some 60% of its listening minutes streamed to mobile devices, not desktops or laptops. There is a lot more information geared to helping companies redefine internal roles to help them focus on this huge mobile platform growth, but it all boils down to the same thing. There is a tidal wave of mobile devices coming in the next 5 years, and they are bringing along with them an exponential growth in engagement and product use because they are so easy to use. The personal nature of a smartphone or tablet lends itself to ease of use and hundreds, if not thousands, more interactions per user in any given month. 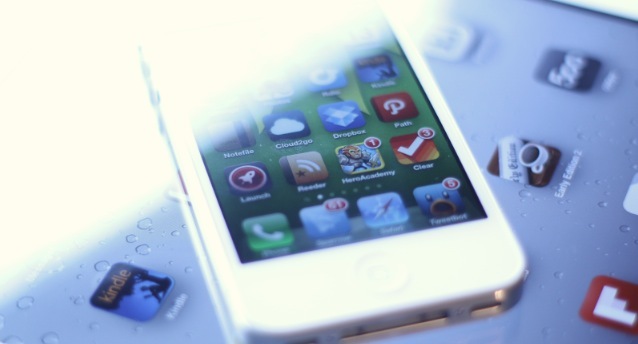 The mobile age is booming, and it’s sucking in a disproportionate amount of traffic and money, get ready.